Following the Great Success of TianSheng's replication of the A380 they have now released the even better and model improved version in the A320. Hosting a number of upgraded features compared to the A380, its evident the factory has spent the time to listen to what the end user has had to say and suggest towards a new line of Airbus products. Firstly the power system has been greatly enhanced supporting Twin 70mm EDF Units and with the provision for a 4S Battery over the previous 3S used in the A380, flights have more power and better managed flight times. Take a look at the photos below and you will see the previous plastic Gear Struts have not been replaced by full metal struts , giving you the strength and reliability you expect from an Xtreme Model like the A320. The Main wing is removable making it easy for transport, no need to buy a bigger car to carry the bigger plane!. Best of all this plane performs like a champion. Smooth realistic take-offs, clean flying lines and the power plant to match, make this model an obvious choice for anyone looking at adding a passenger jet to their hangar. The finish to the Body and Decals is incredible. By touch and look you would swear you were viewing a fibreglass model. Made of EPO based foam, the A320 has the strength to add to its brilliant style and looks. Just add your own Battery and Radio System, everything else is included. We hope you enjoy the video below! Shock absorbers on gear struts! Review : This airliner flies beautifully, especially when modified to 6S. https://www.youtube.com/watch?v=TkEb33ZfcPI Too bad it is not supplied in kit form and spare parts don't seem available. 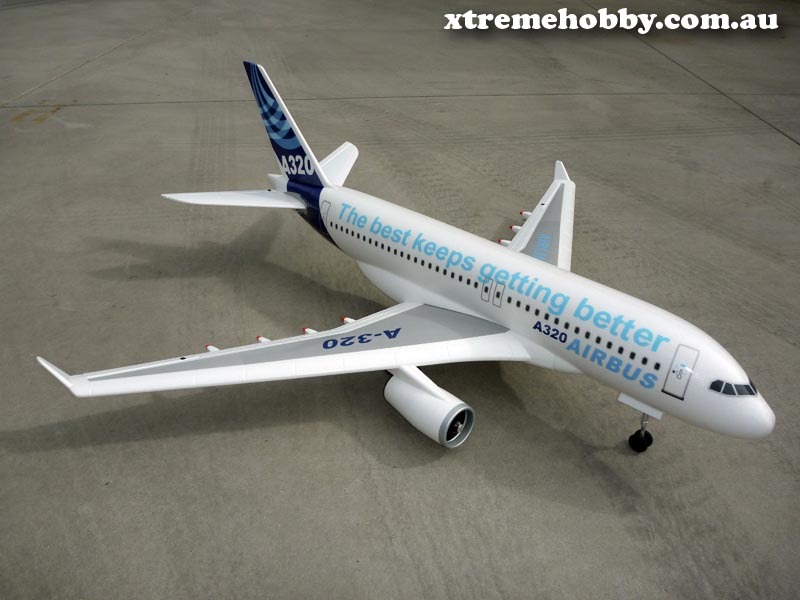 https://www.youtube.com/watch?v=RkeWZwrvMcA Hello Bill, Xtreme Hobby does carry spare parts for A320, they are not on our website, feel free to shoot us an email with what you require. Thanks for the review!